It’s no secret that the Girls Around Town have a real weakness for anything involving chocolate, which they’ll be indulging to the full when they judge entries in The Big Newark Bake Off on Saturday! From 7pm to 9pm on Wednesday 25 June, Chocolate Heaven is an opportunity to find out all about the fascinating journey ‘from bean to bar’. You’ll taste and savour different types of chocolate and be shown how to make and flavour ganache truffles, fondants and caramels. 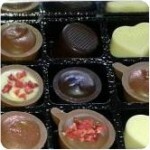 By the end of the workshop, you’ll have your own delicious chocolates finished, boxed and ready to take away and enjoy. Places are limited and available on a first come, first come basis at £25 each, with all materials provided. To book, email relovednewark@gmail.com or call 01636 918746.